So, why am I making a big deal out of a hair cut? Well, you see, my hair likes to give me trouble. If you look at pictures over the years, you'll see the style hasn't really changed. The color has due to the highlights but the shape and texture hasn't. I've always hated it. I used to wear it up almost all the time in school just because no matter what I did to it, it wouldn't work. Plus I was OCD about it look weird. I have thick hair that doesnt this weird thing around my face where it makes an "indent" where my ears are. Way awkward. My hair also knots up and gets tangled a lot (or at least it used to!) I've also tried many products through the years. That's where my stylist comes in. Not only do we need to work with the fact my hair is just gross but we need to accommodate for the highlights. I've tried many shampoo and conditions over the years. Many strays, cream things. We found out quickly I cant just buy stuff from Walmart. It makes my hair all balled up and I cant comb it. So then we started with the products they have at the salon. We tried a few. We mixed them up. I'm still happy to say that we finally found a perfect combo. So today I want to share them with you! 1) This is the best shampoo and conditioner! My hair is dry and usually doesn't have life to it so this is so nice for giving it a boost and moistening it. As I said I've tried many other kinds from Walmart or something but I think whoever makes them puts all this stuff in it. I read online that this Pureology though, doesn't have sulfate and it seems to be a healthier product. 2) So, this straightener was one of those "as seen on TV" and I actually had no idea about it and hadn't seen it before until Brian surprised me with it for Christmas. At first I wasn't sure about it. I used to straighten my hair all the time in high school to make it look decent but it just made my hair flat and broke my ends. This straightener is so gentle and I love how it has the brush plus the roller. My hair is able to be straightened while it's being given a slight curve at the same time. 3) This all soft was a high or miss. the highlights need a little extra care especially at the roots so that they stay in tact. This stuff is basically a more powerful treatment than the conditioner. I only have to use it one a week. The only thing is that it has to be left in for 5-15 minutes. I usually do 5 while just staying in the shower. I can usually see a difference in terms of combing when I use this. 4) I've used de-tangerler strays of all sorts but they don't really work. this is a cream that I use after my hair is towel dried. I just run my fingers through my hair with it. It gives it shine, moister, body. At first it didn't seem like it was working but my hair is so soft and fluffy now, it's great! 5) So, this is just a side note. 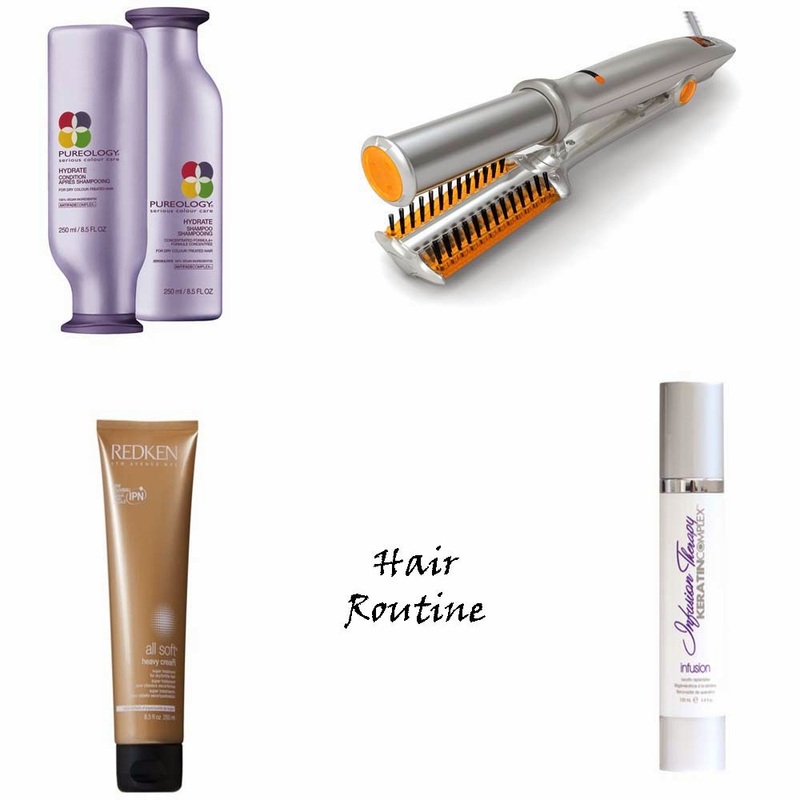 These products have been wonderful and done great things for my hair but they weren't working 110%. That is until my stylist told me something this summer. I'm probably the only person in the world to not know this but you actually aren't supposed to dry your hair. Drying is good for giving your hair body and it helps to not tangle easy but it can actually damage it. She said dry it if I want, when I want. If I want extra boost. I think I've dried it three times since June and it's been amazing! Granted my hair isn't always attractive but my hair has been so much healthier! I love these kinds of posts! Sadly, I blowdry my hair about 5x per week, after letting it air-dry halfway. Then I straighten it in the morning! I wish I could let it air-dry but it honestly looks so much better when I don't!